I’m Jackie, from Domestic Fits, and I’m so happy to be back for the 2013 Passover Potluck! I was hoping that Tori would ask me back again this year, I love a culinary challenge and I had a great time last year coming up with a recipe for the Passover Potluck. Tori and I have known each other since the 4th grade, and even though we lost touch for a long time, we met up again as adults through blogging, I guess we were just destined to be friends! And if you were wondering, she is one of the most genuine and wonderful people I have ever met, plus she’s even more gorgeous in person! I was determined to make you all a dessert that was not just Kosher for Passover, but pareve as well. I tried three different recipes because I wanted it to be GREAT, not just “good for pareve.” The first two were just “good” and the third try was the charm, it’s amazing! This is a Pavlova, it has a crispy outside and a soft, almost chewy interior. Pavlovas have a super fancy feeling, but are deceptively easy to make, perfect for a dinner party. 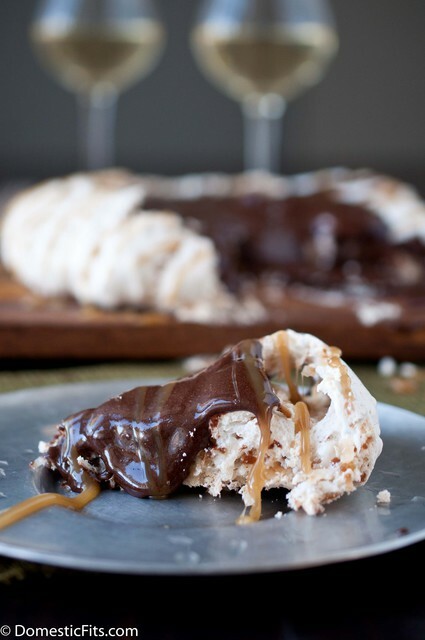 With the coconut, cocoa pudding, and caramel sauce, it tastes like a giant Girl Scout cookie. I hope you love it as much as I do. 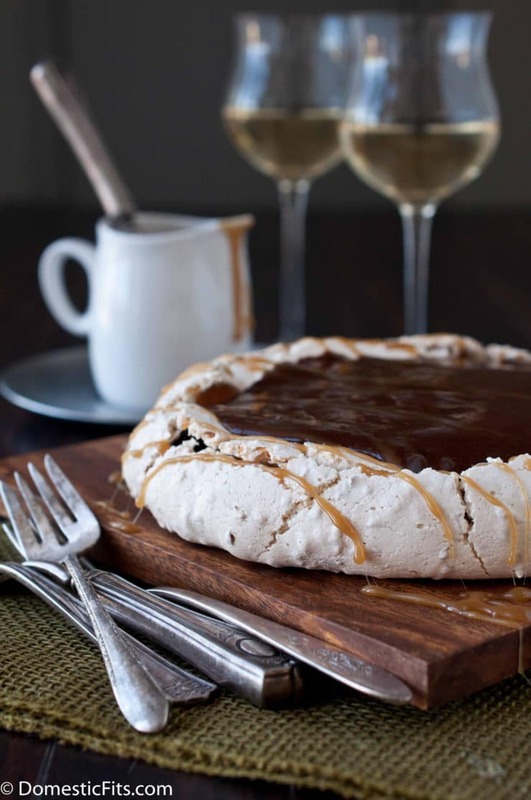 A pareve Kosher for Passover toasted coconut pavlova topped with cocoa pudding and caramel sauce. Tastes like a big Girl Scout cookie! Preheat oven to 300. Add the coconut to a dry pan. Toast over medium high heat until most of the coconut is golden brown, stirring constantly to avoid burning. Remove from heat, set aside. In a small bowl, whisk together the sugar and the potato starch (or cornstarch). In the bowl of a stand mixer add the egg whites and pinch of salt. Beat on medium speed until soft peaks form, about 5 minutes. Turn mixer to high and slowly add the sugar mixture, continue to beat until peaks start to firm, about 1 to 2 minutes. Slowly add the vinegar and vanilla, beat until stiff peaks form and the meringue is glossy. Remove bowl from the stand mixer and gently fold in the coconut using a spatula or wooden spoon. Cover a large baking sheet with parchment paper. Spoon meringue onto to parchment into an 8-inch circle. Make a well in the center (this will hold the pudding and caramel). Place baking sheet in the oven and bake until the pavlova is dry and “crisp” on the outside, about 45 to 55 minutes. Turn off the oven, open the oven door halfway, and allow the pavlova to cool in the oven to room temperature before removing. To make the pudding, add the egg yolks, sugar and cocoa powder to a cold pan (that just means you don’t want the pan added to the heat yet, but it doesn’t need to be “chilled”). Whisk until well combined. Put the pan on medium high heat, whisking in the coconut milk and the water. Cook, stirring constantly until thickened, about 5 minutes. Remove from heat and allow to cool slightly before adding to a storage bowl. Chill in the refrigerator until cold, about 1 hour. Pudding can be made up to 3 days ahead of time. To make the caramel sauce, stir together the brown sugar, white sugar and water in a saucepan over high heat until the sugar has dissolved. Clip a cooking thermometer on the side of the pot. Allow to boil undisturbed until the sugar reaches 230. (Don’t stir the caramel while it’s cooking or it will crystalize, but you can occasionally “swirl” the pan to redistribute the sauce.) Once the caramel reaches 230, remove from heat and add the vanilla, stir until well combined, it will bubble up furiously, then stir in the coconut milk. Return to a boil, stirring continually for two minutes. Remove from heat and allow to cool to room temperature. Caramel will thicken as it cools, but if it becomes too thick to pour, heat it a bit to thin. Caramel can be made up to 3 days ahead of time. Once the pavlova has cooled, place it on a serving plate. Pour the pudding into the well in the center (this recipe makes a large amount of pudding, you may only want to use half of the pudding and save the rest for another use). Drizzle with caramel sauce or serve the caramel sauce on the side for your guest to drizzle as they like. This turned out quite beautifully! The meringue was perfect! A great texture, nice and crisp. The pudding came out a little grainy (as happened to another commenter), but once it was poured over the pavlova and served, you really couldn’t tell. I’m not sure if the sugar didn’t melt properly, or I got scrambled eggs… I wasn’t really able to mix the egg yolks with the sugar and cocoa, as it wasn’t enough liquid to really dissolve it. Until I added the coconut milk/water mixture, I wasn’t able to really stir the pudding. I also cooked much longer than 5 minutes and still didn’t feel as though it had set, but it did once I put it in the fridge. If I attempted this again, I might do it over a double boiler so the heat would be gentler. The caramel sauce was delicious but made way too much and needed a pinch of salt for my taste. I think overall the one big improvement I would make would be to make these individual. We were only 4 people, didn’t eat the whole thing and it felt kind of wasted, because how do I keep it, now that the pudding is soaking into the meringue? I think it would be really easy to make little individual pavlovas and top them only as needed. 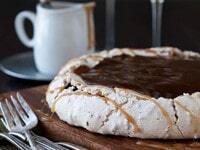 Even though the meringue wouldn’t be as good the next day, it’s probably still better than soggy meringue! Overall though, a delicious K for P dessert that didn’t taste K for P! Great feedback Sarah, thank you for sharing the detailed comment– I’m sure it will help others in the future. Chag Sameach! Hi!! I tried to make the pudding and it came out sandy. What is my mistake? Thanks!! This looks so tasty. My son is allergic to dairy, so this recipe looks awesome. My question is this: do you used canned coconut milk or the boxed version in the refrigerated section? Hi Alissa, not sure if there is a good brand that is hechshered KFP (the majority of my readers aren’t looking for a hechsher), but if you Google “make your own coconut milk” there are simple instructions for making your own coconut milk online. I am going to double this recipe and put in a trifle bowl. I’ll let you know how it turns out. I made this for passover to night. Everybody loved it. I made a couple of changes. I did not make the caramel sauce as I ran out of time. So I cut up some fresh strawberrys, blueberrys and raspberrys and arranged them on top of the chocolate,it was very tasty..
Whoa! looks and sounds amazing!! How far in advance can this be made? How many does it serve ? Hi Barbara! The pudding and caramel sauce an easily be made three days ahead and store in separate air tight containers in the fridge. The pavlovas can be made the day before, but they are not as good. I would make the pavlovas the day you want to serve them. It’s pretty rich, it serves about 8. How deliciously sinful! And I always thought that the classic pavlova couldn’t get any better!!!! So creative, isn’t it?? Love!